It's Day 6 of the 12 Days of Christmas and I think today's ornament might actually be my favorite of the series. That's hard for me to write because I'm really happy with all my ornaments, but this one's just so darn cute. 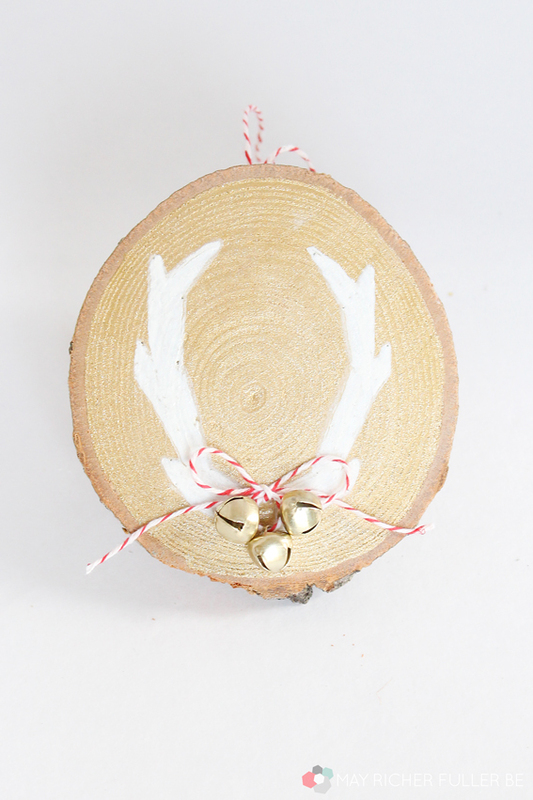 I mean, how can you resist a combo of reindeer antlers and bells on top of a wood slice? That's one magical combo if you ask me. I nabbed some clip art of some reindeer antlers online (can't remember the source, sorry!) 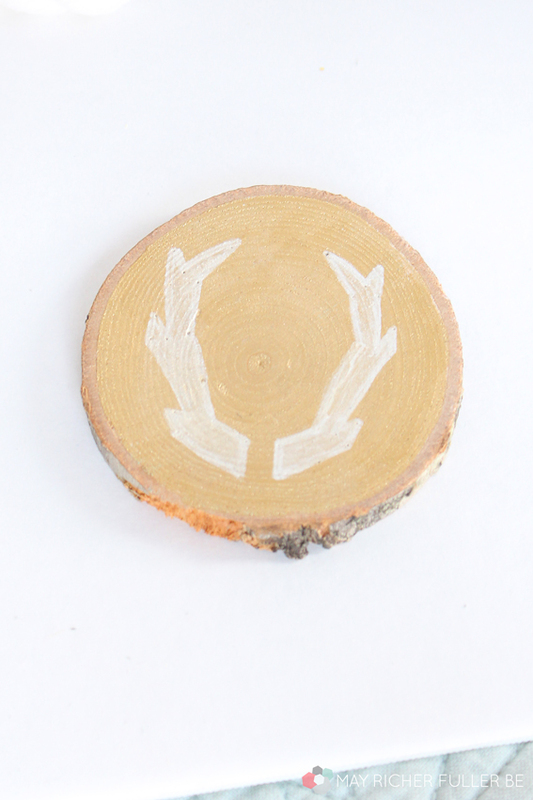 and printed them out in a size that would fit on my wood slice. Sometimes it takes a little trial and error to get this right. 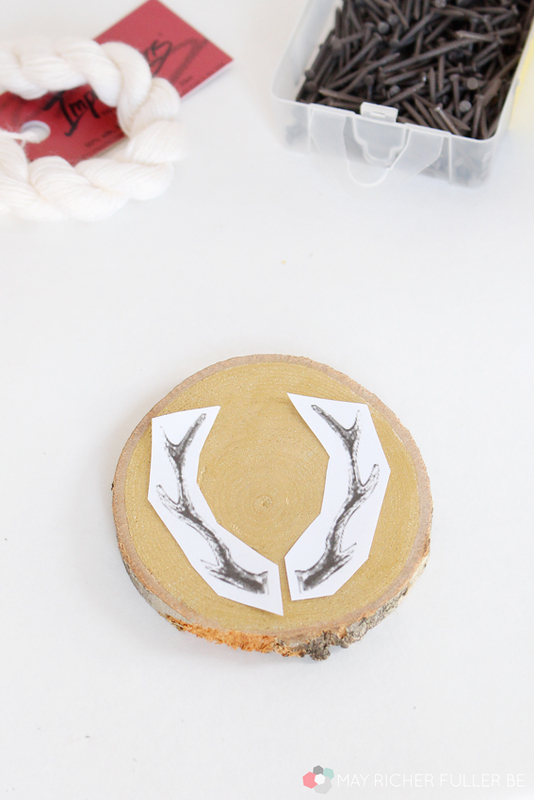 Since I wanted my antlers to look a little bit more abstract, I didn't trace around the outline with a pencil like Dusty did here for her monogrammed wood slice ornament. 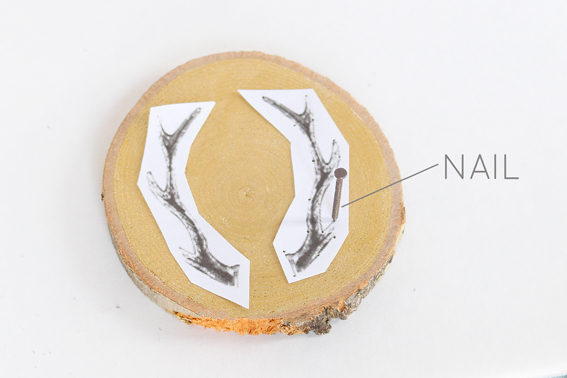 Instead, I used a hammer and nail to mark the points and corners of the antlers. A little tap of the hammer is all you need to make an impression in the wood. Then I used my white paint pen to connect those dots and fill in the antlers. It took a couple of coats of white paint to make it opaque. The photo below is after one coat. Pretty cute, huh? 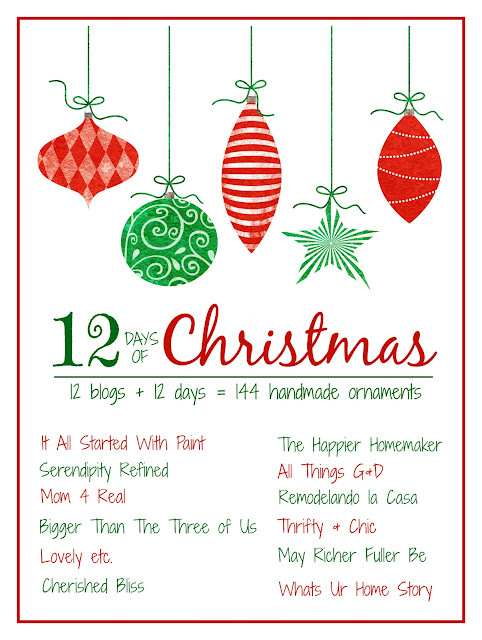 Now go forth and be inspired by the other 12 Days of Christmas bloggers! Links are below :). 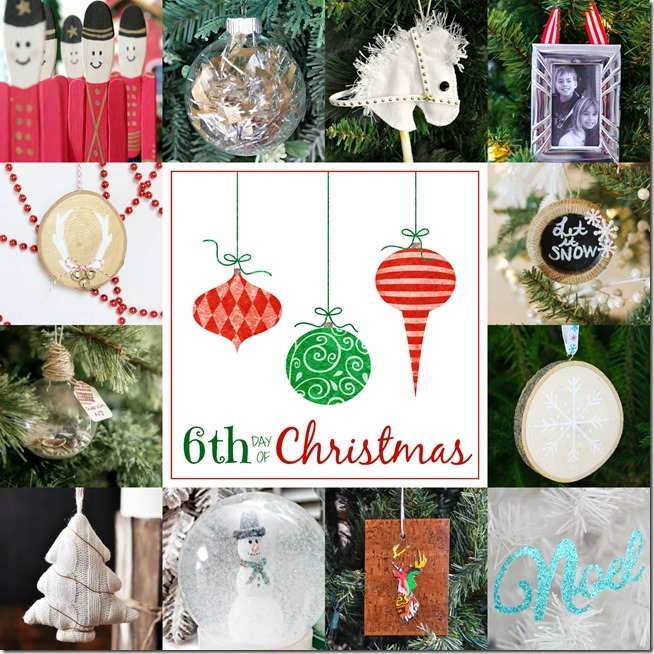 Glitter Noel Ornament | Lovely Etc. Disclosure: Some of the products used in this post were purchased with a gift card which I received from Michaels. Thank you, Michaels, for supporting my craftiness! This post also contains affiliate links, which means I earn a small commission from your purchase at no cost to you. 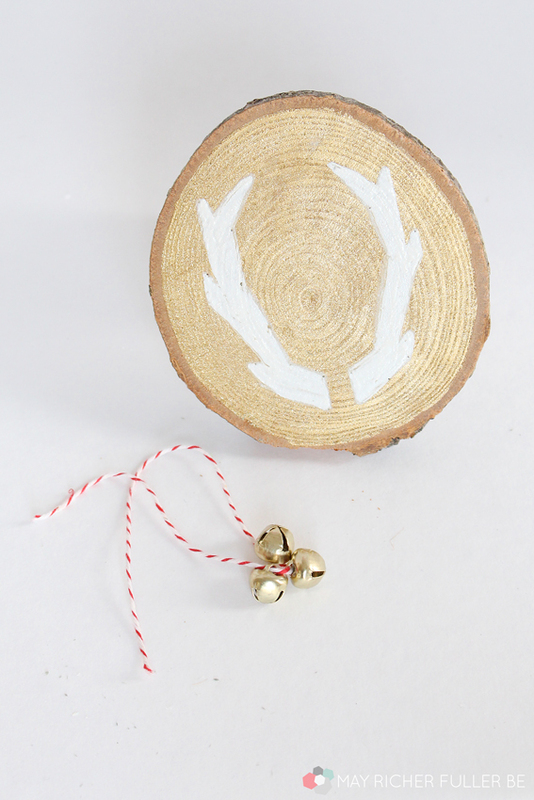 Your ornament is so cute, simple, not busy. Love that idea and seems pretty quick to make. 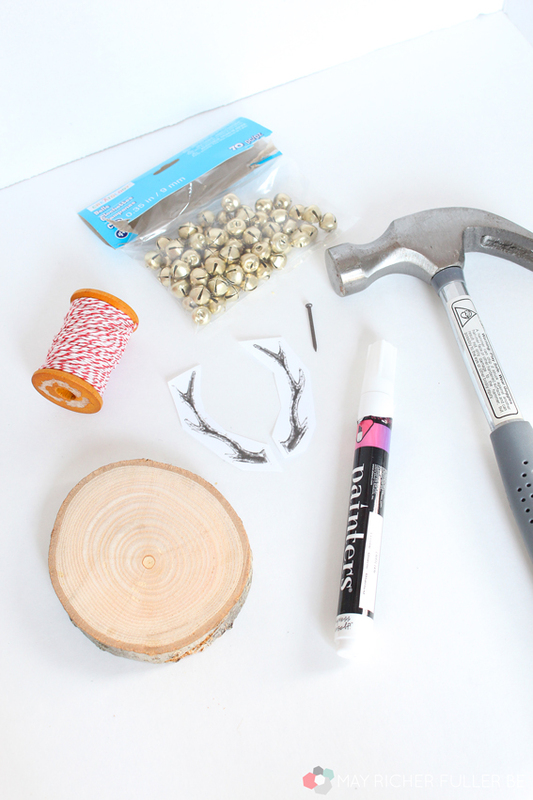 Like idea of doing the nail holes to get form of antlers. Pretty smart and very cute idea. That truly is one killer combo of amazing!!! Just love it -- and those little jingle bells are the icing on the ... well ... wood slice!!! 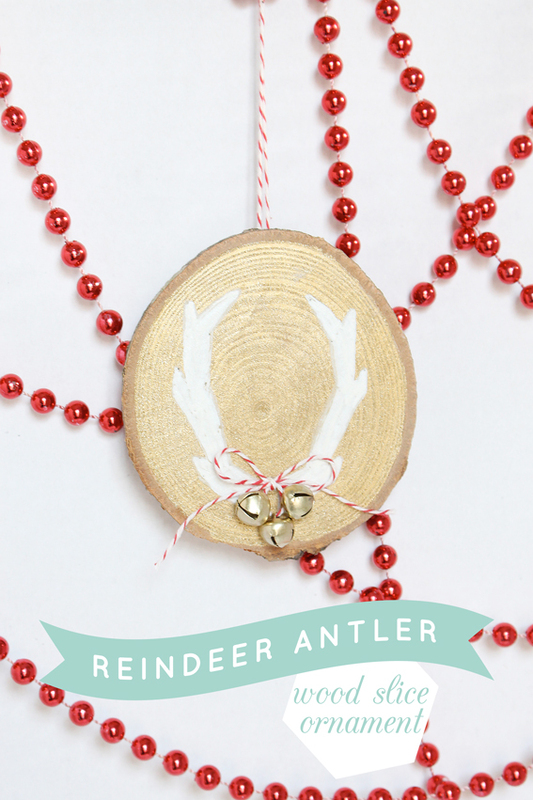 Antlers and wood go so well, the bells were the extra touch that I loooove! Totally adorable. The bells and the bow make it too cute. It also helps that her glowing sun-kissed complexion compliments the pastel hued frock, making us want to put Timberland Sale some fake tan on before buying one like it… A bold blue dress such as this is a great transition frock to get out of winter dressing and start preparing for your spring/summer wardrobe, so get clicking to the right to Timberland Outlet online buy Jess' exact one. Alternatively, shop our style edit below to find a similar one you like. time performance, most notably Designer handbags ArgentiumR Ge silver alloy with this gold watch, let show a very unique nostalgic texture. Watches Replica Repetition Minutes Argentium, ArgentiumR patent germanium and silver alloy material watchcase, handbag replica table 49 mm in diameter, when, in two, five seconds, a small Dubois Depraz asked time, hand UK Replica watches chain five two Q movement, sapphire crystal mirror, bottom Gai, germanium and silver Replica Rolex Watches alloy. تقوم بادارة الشركة نخبة من الضباط شركة حراسات امنية و رجال القوات المسلحة المعروفون بالكفاءة و الانضباط في عملهم شركة امن وحراسة كما يقوم بمساعدتهم في الادارة بعض رجال الأمن المدربين جيدا على استخدام شركة امنية كافة الأجهزة و الأسلحة اللازمة لعملية الأمن .